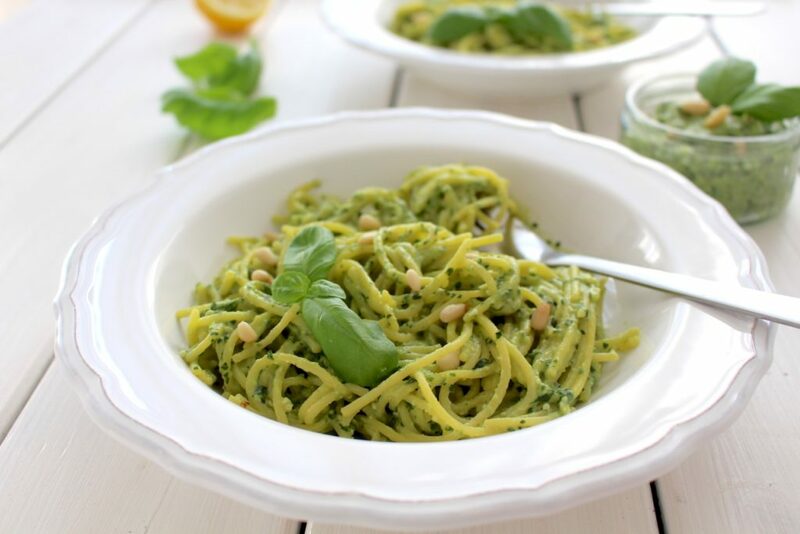 Pasta with pesto has always been one of my favorite pasta dishes. It’s a super simple Italian classic, but so delicious. 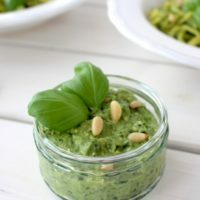 This secretly healthy pesto is made without cheese (and therefore is vegan) and without any oil. The secret ingredient, which actually isn’t very secret since it’s mentioned in the headline, is avocado. 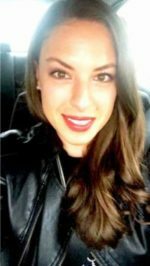 It’s just always better to use fat in a whole food instead of a concentrated form. So instead of using avocado oil, it’s better to eat the avocado instead. The same is true for olives and olive oil and so on. Eating the whole thing is better as it’s more substantial; full of fiber; less processed. So for this recipe you won’t need any oil, since it’s made from avocado and pine nuts, both providing healthy fats. 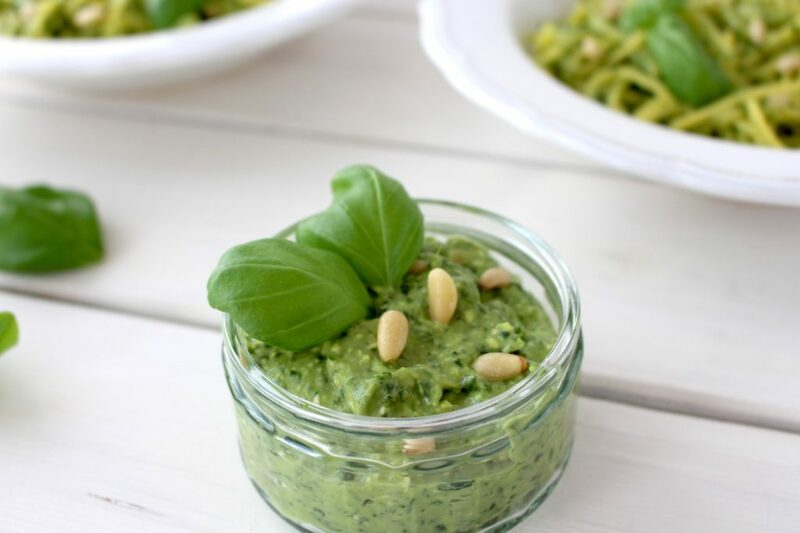 Also, I like to add a handful of spinach because it boosts the pesto with even more nutrients – without tasting it. This is a very easy recipe that makes a jar of pesto. If you don’t serve it all at once, you can keep it in the fridge for future use (up to 3 days). This makes dinner really straightforward, since all you have to do is cook some pasta and add about 2 tbsp of the pre-made pesto to your dish. However, if you don’t want to eat pasta three days in a row, which I honestly wouldn’t understand, you could make a pesto based pizza or use it as a dip. I hope you love this recipe – please let me know in the comment section below! If you make this pesto, make sure to take a photo and share it on my Facebook page or on Instagram, using the hashtag #minamadefood. Oh and don’t forget to tag me (@thisisminamade) so that I can see your creations! 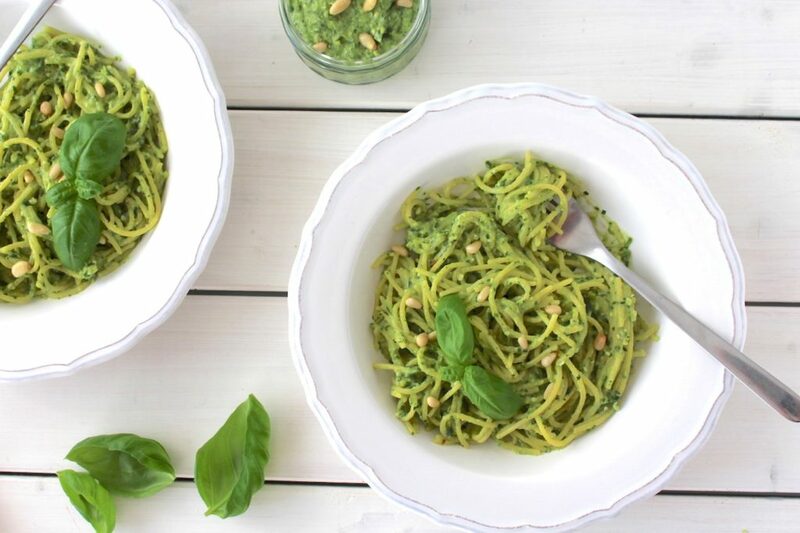 This vegan pesto is free from oil and parmesan cheese, and yet is so good! I like to make it even healthier by adding an extra handful of spinach. Add all the ingredients to the bowl of a food processor and blend until smooth. You may need to scrape down the sides every so often. You could use an immersion blender. If necessary, add some water (or even some olive oil if you don't want to omit it completely). Serve with pasta, use as a base for pizza, or serve as a dip. Keeps well in an airtight container in the fridge for up to 3 days. Pine nuts taste even better when roasted. Toast nuts in dry a pan, shaking frequently. Nutritional yeast is a deactivated yeast. It has a strong cheesy, creamy flavor and therefore is perfect for the pesto or as a cheese substitute in general.